Unlike the ancient Greeks, today's mythmakers tell stories and build legacies using a variety of media. After reading Homer’s The Odyssey, students were tasked with creating their own personal mythologies to share with the community. The result? 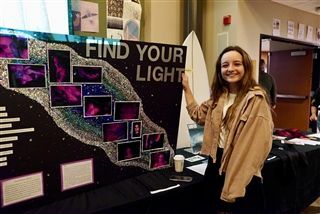 On January 9, families and friends attended a showing of imaginative student work, which included an original choose your own adventure book, a fast-motion video of the construction of a LEGO Colosseum, poetry collections, video games, a Mexican candy business, a Banksy-inspired graffiti art station, and many more.